Non-Newtonian ink printing is the future of additive manufacturing. It does not require added heat, instead relying on a pump to eject any number of materials with thick consistencies onto a build platform. However, like any other 3D printing method there is an issue when multiple inks are used for the same product. The use of multiple extruders comes with inherent inaccuracy associated with the transitioning of extruders. The solution is to use a single printhead in a programmable manner. 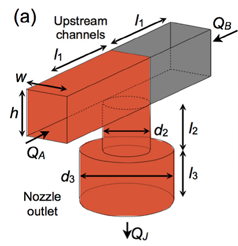 In this example, FLOW-3D is used to simulate a two-ink microfluidic printhead for printing inks. The setup of the printhead is shown in Figure (a). Since the viscosity of inks is strain rate dependent, FLOW-3D allows the user to specify the fluid property in a tabular form representing the strain rate-viscosity curve. Figure (b) shows the programmable control of the incoming discharge rates of inks from the two ends of the printhead. In FLOW-3D, the exact boundary condition has been specified. FLOW-3D‘s Moving Objects model simulates the movement of the printing platform at a designated speed. In this case it is 2.65 mm/sec. Quantitatively, the research shows that for a peak discharge rate of 1600 micro-liter/min, the distance over which the fluid fraction of any ink reduces from 1 to 0, is within 1mm. It is observed that a complete transition happens around 0.5 mm of printed ink streak. This matches with experimental results1. The animation above shows the process of transitioning from one ink to another ink in a programmable manner. The transition length from blue to red ink is within 1 mm, qualifying it to be a sharp transition in accordance with the experimental results. 1This study is based on the paper from James O. Hardin, Thomas J. Ober, Alexander D. Valentine, Jennifer A. Lewis. Microfluidic Printheads for Multimaterial 3D Printing of Viscoelastic Inks, 2015. Figures (a) and (b) have been extracted from this paper. Yes, please sign me up to receive email news. COPYRIGHT 2000 – 2019 FLOW SCIENCE, INC. ALL RIGHTS RESERVED.